Origins don’t come much more convoluted than that of Top Cat Begins. A sequel to 2011’s Top Cat: The Movie, also made by the Mexican animation studio Ánima Estudios, it features characters from the popular 1960s Hanna-Barbera television series, that was itself at least partly inspired by the hustlers of The Phil Silvers Show, also known as Sergeant Bilko. Top Cat: The Movie unwisely attempted to embellish its protagonist’s humble environs by incorporating a sci-fi storyline in which Top Cat fought a robot army. Perhaps as a result of the criticism that generated, Top Cat Begins repositions the feline (voiced by Jason Harris) back in his down-at-heel city home, running scams on local businesses and getting under the feet of Officer Dibble (Bill Lobley). As with JJ Abrams’ first Star Trek movie, there’s a reasonable amount of fun in seeing how the iconic characters originally met each other. After being rumbled while posing as a health inspector in a nightclub, Top Cat has a flashback which shows him hooking up with his diminutive pal Benny (Chris Edgerly), and forming a cat-pack of pals to take on the mysterious Mr Big (Darin De Paul). Perhaps revealingly, one of the items of rubbish Top Cat tosses out of the garbage can he calls home is a DVD copy of the 2011 film; director Andrés Couturier’s film wisely scales things down as it attempts to get back to the comedic values of its source material. 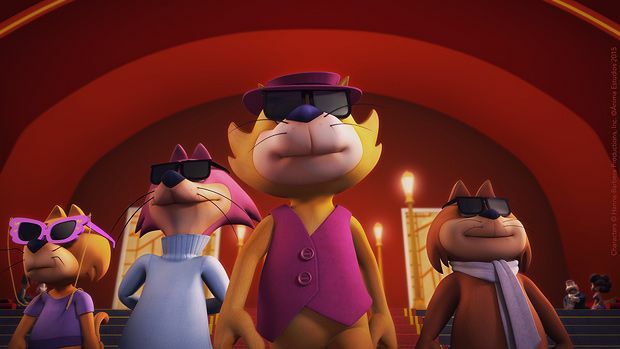 Despite a slew of randomly thrown together pop culture references (from Reservoir Dogs to Psycho) that are likely to baffle the target audience of kids, parents will at least recognise their old favourites in Top Cat Begins – with it replicating the kind of silly, simple knockabout routines that should be right up the alley of the cat’s original fans. General release from Fri 27 May. Top Cat and his cat pals get together in this prequel to 2011's Top Cat: The Movie. Simple knockabout fun, closer in spirit to the original cartoon series than the earlier film.